Congratulations to Mike Breviglia, Brian Halloran and Luke Thompson on being named 2014 Hockomock League All Stars! This is Mike's 2nd year being named a Hock All Star and Brian and Luke's first. Mike Breviglia and Luke Thompson both shot a 38 to lead the Bulldogs past Stoughton 154-180 at Blue Hill CC. Mike Breviglia shot a match low 37 to help Canton beat Taunton at Segregansett CC 164-169. 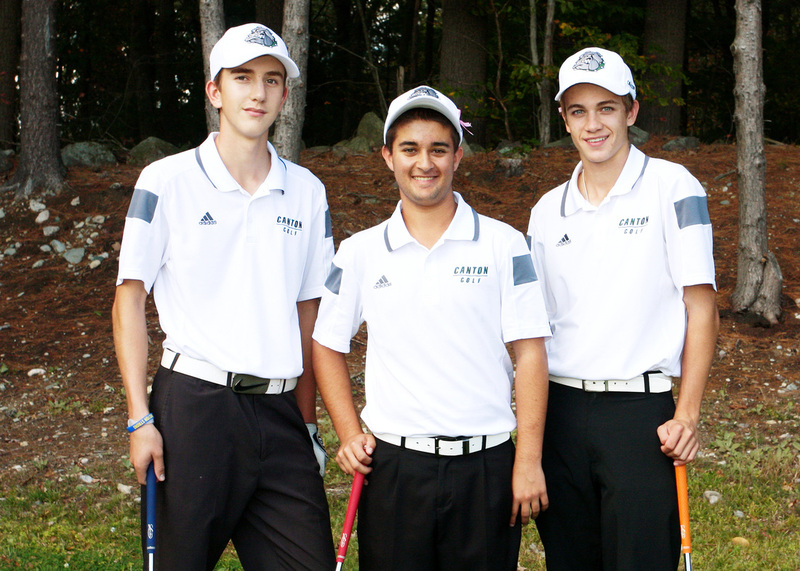 On Friday October 10th, Blue Hill Country Club hosted the Hockomock League Championship. Mike Breviglia shot the low score for Canton with an 84. The Bulldogs finished 5th in the championship. Brian Halloran and Steve Gorham both shot a 37, Luke Thompson shot a 40 and Jim Jenkins shot a 41 in a 155-168 win vs Mansfield at Blue Hill CC. Brian Halloran and Luke Thompson both shot a 39 to help Canton beat Franklin 159-170 at home. Mike Breviglia came in with a 40 and Steve Gorham came in with a 41. Canton fell to Foxboro by 1 stroke at Foxboro CC 169-169. Mike Breviglia had the low round for Canton with a 40. Brian Halloran shot a 36 and Mike Breviglia shot a 38 in the loss to OA 165-163. Bulldogs beat Milford 157-187 at Blue Hill CC. Mike Breviglia and Brian Halloran both shot a 38. Shane Ezepik shot a 40. Steve Gorham and Jack Goyetch shot a 41. Canton qualifies for the state tournament with the win. This is the 5th year in a row the Bulldogs have qualified. Canton falls to OA in a close one 152-148 at Pine Oaks. Next match is Tuesday vs Milford at Blue Hill CC. Griffin Jerrier shot a match low 41. Bulldogs win 168-192 at Sharon. Brian Halloran shot a 1 under 35. Canton wins 155-178 vs Stoughton at Easton CC. Mike Breviglia shot a match low 36 to lead the Bulldogs to a 163-168 win vs KP at Blue Hill CC. Luke Thompson's 36 led the Bulldogs to a 163-167 road win vs Milford at Hopedale CC. Canton moved to 2-0 with a 164-184 win vs Sharon at home on Tuesday. Brian Halloran had the low score of the match with a 38. The Bulldogs won their first match of the season at Home vs Foxboro on Wednesday 159-167. Brian Halloran led the way with a 37. Luke Thompson shot a 39 and Mike Breviglia shot a 40. Phil Pennacchio ans Steve Gorham both shot 43 to round out the scoring. The next match is on Tuesday 9/9 at home vs Sharon.